South Lakeland District Council says around 200 approved applications are still outstanding despite the deadline. Chatsworth Tennis Club in Carlisle welcomed former David Cup stars today, in a fundraiser for the flood survival fund. "We really were badly hit by the flooding in 2015. "Whilst we are ticking over, insurance and things like that are very difficult to get off the back of the flood so that's been very difficult and obviously we need to look at safeguarding the future of the club." Players of all ages took part, with the juniors kicking things off in the morning. They were coached by the likes of Danny Sapsford, who represented Great Britain in the Davis Cup for five years. "I am actually really impressed. I've visited probably about 150 clubs over the past two or three years and in all honesty the kids here are some of the best i've seen so you're clearly doing something right." Organisers of the event say they'd love to see more people give tennis a go and would like to welcome everyone to the club. A Carlisle school have begun teaching lessons in Food Technology again after repairing the damage to their kitchen caused by the December 2015 floods. Central Academy has been undergoing a year of refurbishment work on the campus. The first lesson in the school's new kitchen took place today. The Food Technology department says learning about food can improve the quality of the students' lives. Learning about food at Central Academy is a practically involving experience. Food presents people with everyday decisions to make and problems to solve. Students need to develop the knowledge, skills and practical capability to meet needs and requirements through appropriate responses to the challenges which food presents in their lives. As such, food has a role to play in linking aspects of education that relate to health, life skills and in preparing young people as citizens. A new charity has been launched in South Cumbria in response to the floods in December 2015. Hope Community will work on long-term issues. Labour MP for Workington, Sue Hayman, pressed the floods minister today about money owed to local authorities to help pay for damage caused in last year's floods. In her new role as Shadow Minister for Flooding and Coastal Communities, Mrs Hayman said Allerdale Council is owed nearly £220,000 by the UK Government. Secretary of State for Environment, Food and Rural Affairs, Therese Coffey, said she would look into the matter. More than seven thousand homes and businesses across Cumbria flooded in last year's devastating storms, new analysis shows. The study, by the Local Government Association, says that 6,568 homes and 897 businesses were affected in the county. That's almost half of all the properties hit in the eight worst-affected parts of the UK. The Association says councils are still helping flood-hit homes to recover from the disruption caused by storms Desmond, Eva and Frank. Ahead of this winter, town halls are encouraging people to be prepared for future flooding, by taking steps such as checking if they are at risk, signing up to free warnings and identifying what to take with them if they need to evacuate their premises. Council leaders are calling for future flood defence to be devolved by the Government to local areas so that councils can work with communities and businesses to ensure money goes to projects that best suit local needs. Martin Tett, a LGA environment spokesman, said: "Councils are doing everything they can to protect households and businesses from the possibility of further devastating flooding this winter. "Such was the severity of last year's storms, some councils, who have experienced significant reductions to their core funding, are still helping residents to recover even now." He said devolving funding to local areas would support projects that reflected needs such as protecting key roads and bridges to keep residents and businesses moving. Seven flood alerts have been issued for Cumbria. The flood alerts, issued by the Environment Agency, mean that 'flooding is possible' and residents should 'be prepared'. You can find an interactive map live updates of flood alerts here. The plans include £12.5 million funding for new temporary flood defences ahead of this winter. 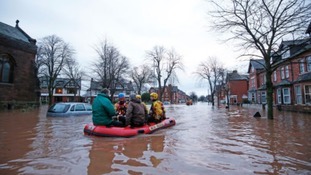 Grants of up to £5,000 are available for flood-hit residents and businesses in Carlisle.